Date : Wednesday 9th March 2005. 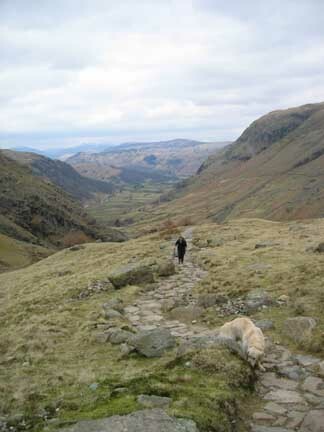 Midday start from Seathwaite ( Map ref: NY 235 122) to Seathwaite Fell, possibly further. 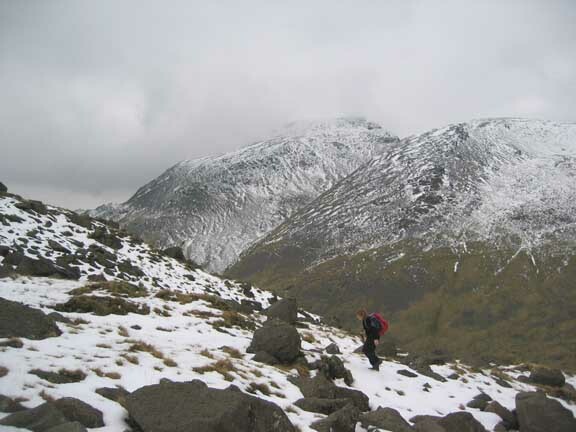 Occasion : A walk in search of the snow, under the high fells of Cumbria, Uk. 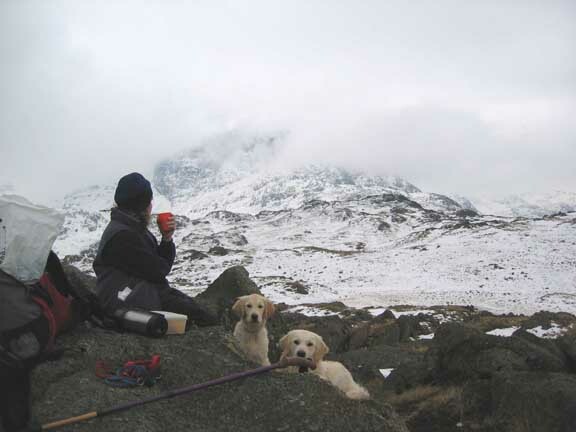 Walk details : 5 miles, with 1800 ft of ascent, 4.5 hours, including a stop for lunch. Weather : Clear but grey, with a high cloud base at 3000 ft, but patchy mountain mist coming and going as the afternoon progressed. Slight NE wind and but mild despite the snow. 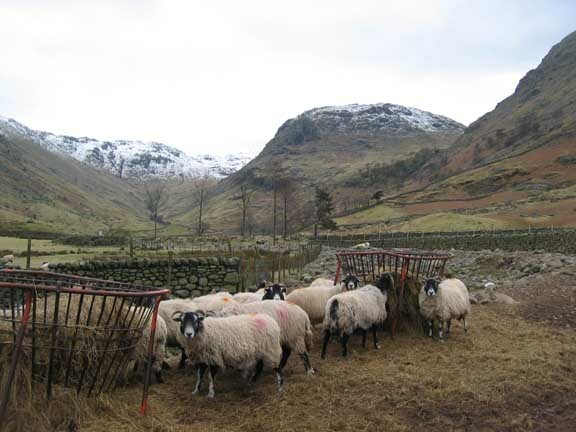 photo: the sheep with winter fodder at Seathwaite, with Seathwaite Fell behind. It was a reasonably clear day at Loweswater and the dogs needed a walk. For that matter so did we. 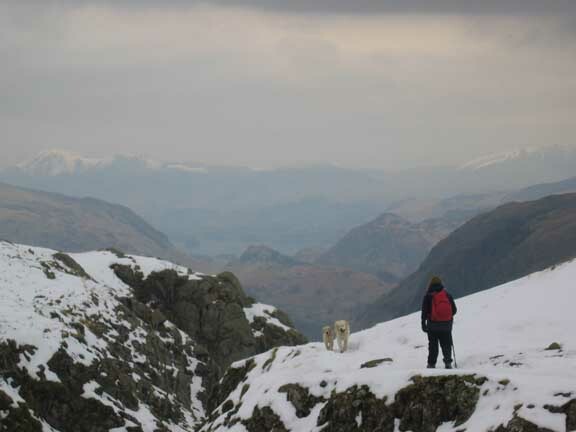 The options were to go for something like Barrow and Outerside, a great two to three hour walk, but with the thaw much in evidence we opted for a trip into the snow in the high fells of Borrowdale. 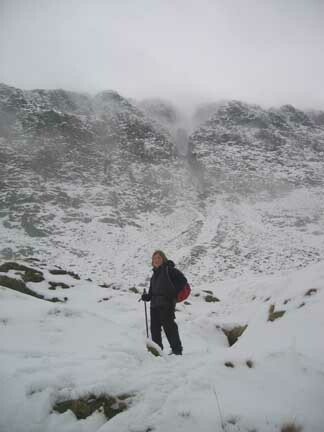 Our starting point was the summit of Seathwaite Fell. The weather was overcast and but not particularly wintry. 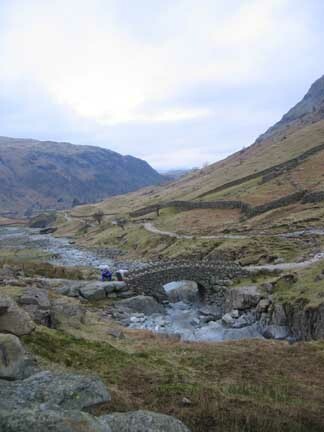 we parked just short of the farm at the head of Borrowdale and walked up to Stockley Bridge. There we turned right alongside Taylor Gill Force and up towards Sty Head Tarn. The winter storms were evident here, as in Buttermere, as several of the trees in the plantation surrounding the waterfall had been blown down or snapped off like matchwood. Onward and upward on the engineered path. 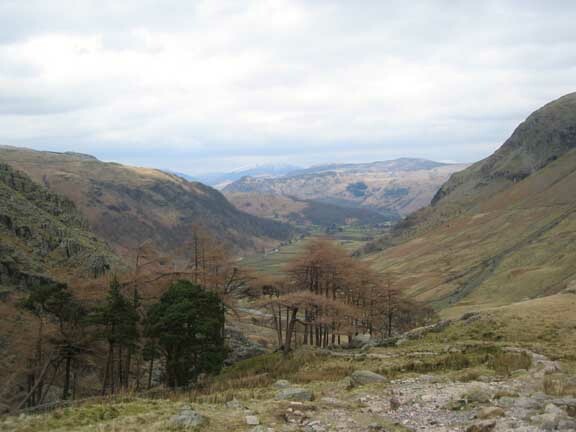 Our backward views of Borrowdale improving as we climbed. To our left was Seathwaite Fell, our target "summit" of the day. Above it an RAF rescue helicopter, hopefully not on a mission today. 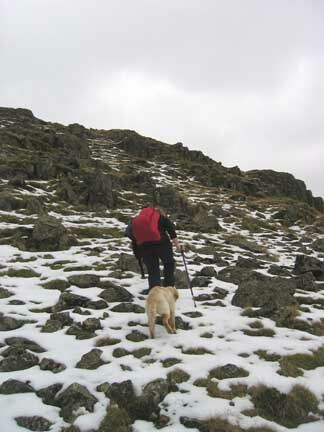 We hit the snow about two thirds of the way up the steep northerly side of Seathwaite Fell, but with careful placing of the feet the ascent was quite acceptable. Near the top now and our view of Great Gable and Green Gable improved as we climbed. 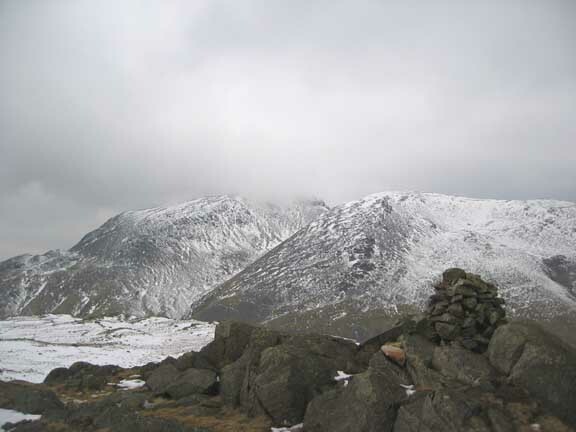 The high cloud at the start of the walk had lowered to give Gable a misty summit. This cloud was to come and go during the next hour or so with wonderful effect. 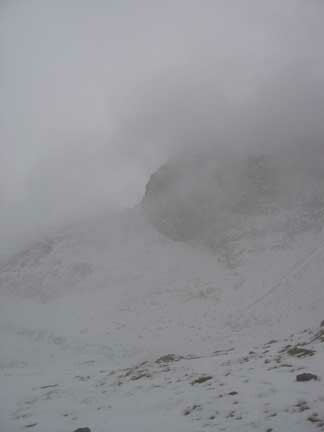 The summit of Seathwaite reached without great problem. 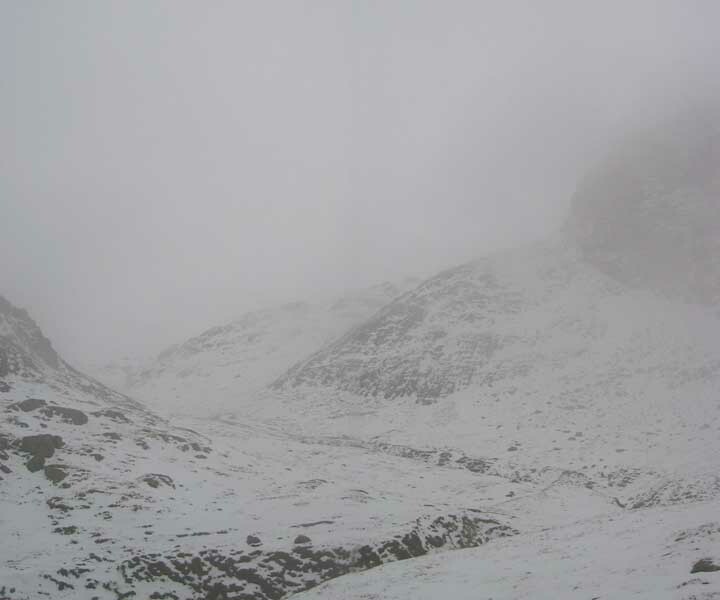 Allen Crags to Great End, Lingmell and the dark slopes of Great Gable to the right. as we watched the clouds come and go across the face of Great End . . .
Oh yes . . . don't forget the dog biscuits ! Seathwaite Fell was delightful in its monochrome beauty. 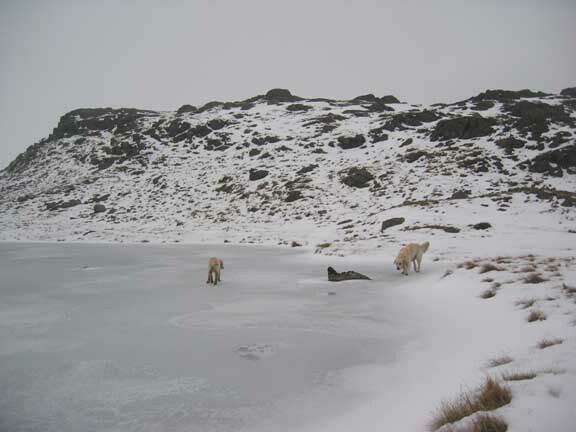 This was one of the frozen tarns on the traverse of the flattish summit plateau. A frozen Sprinking Tarn as the mist rolled in. as we gazed at the impressive buttress that was Great End . . . but not today ! 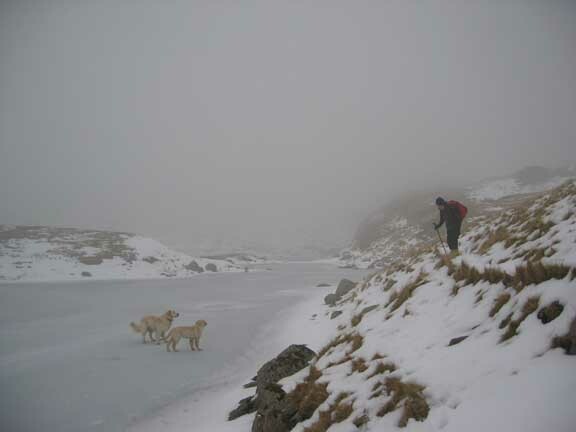 Visibility was impaired but not drastically as we passed along the edge of the tarn. The dogs ventured onto the ice but we declined. It sounded solid but the edges were certainly thinner than they looked as Ann found out. At the furthest point of our walk we joined the path from Sty Head Tarn. The cliff face ahead of us appeared and disappeared as the clouds rolled by. This is what we had come to see. 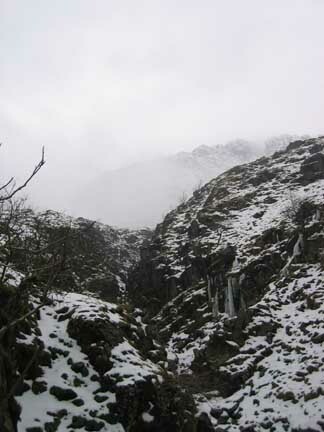 A snowy Great End and the top of Grains Gill. Now to find the start of our path down. 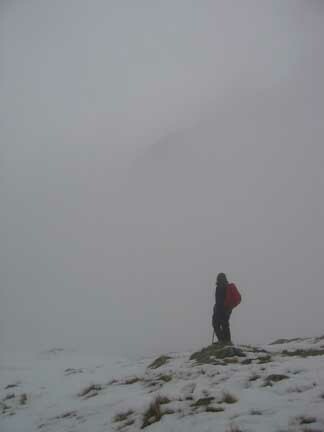 As we started down the path alongside Grains Gill the cloud cleared and the face of Great End stood out majestically. but not for us today . . . ! One half of the party, and both dogs !
. . . and the other half starting her way down. 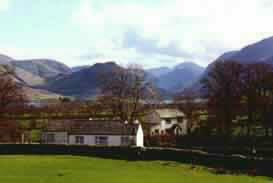 Ahead we could see Borrowdale, Castle Crag and the distant snowy fells of Skiddaw and Blencathra. 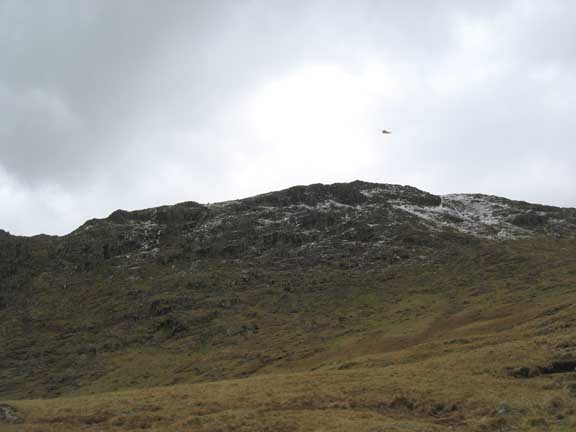 and the outline of the high crags above. All of a sudden we were below the snow line, the scenery and the colour had changed. 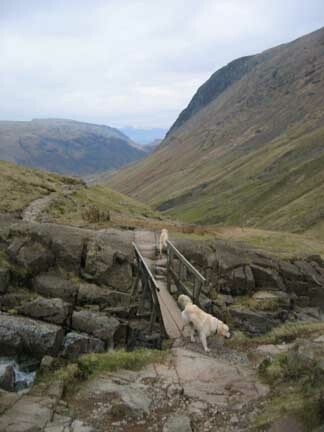 We made our way back across the top footbridge, and then down via Stockley Bridge to the car at Seathwaite. 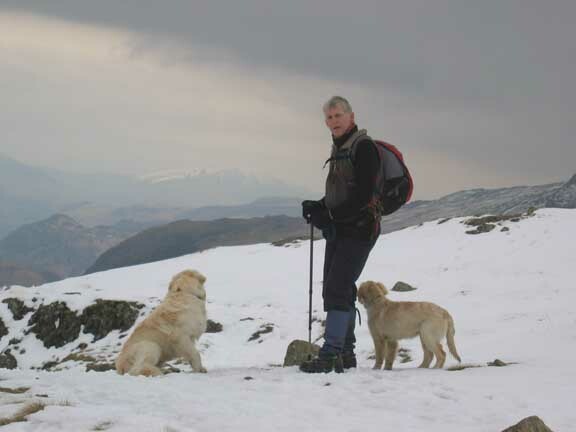 A great four hours plus walk, in the high fells shrouded in their wintry mantle. This site best viewed . . . with a warm cuppa-soup and maybe a salmon sandwich ?.